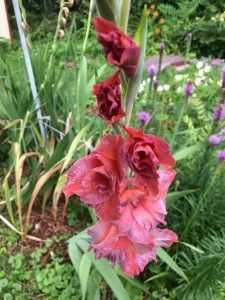 Summer Tips | George Witt Service, Inc. Does your car smell sweet? If you get a sweet odor when outside your car, it may be a sign of a coolant leak. Some say it smells like maple syrup. Please do 3 things. First, get it checked for leaks by a shop. Also watch for puddles on the drive or garage floor that may attract pets and clean them. Coolant is poisonous. Finally, share this post with all your friends. When your car tries to communicate with you, please pay attention. We’re the experts in preventing car trouble. We want you driving, not walking. Don’t let anyone get locked in the trunk! Share this to save a child’s life! Most cars have a trunk release button inside the deck lid. Teach your children what these are and how they work. In the event a child or person accidentally gets locked in a car trunk, this release button gets them out. Some of these even glow in the dark. In this weather, it doesn’t take long to die from the heat. We care about our customers and their safety. 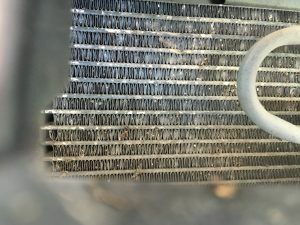 Every spring, you should have the local AC people clean the condenser on your home AC and install a new furnace filter, right? This car came in for a noise while rolling. Good thing, they were down to their last ply on the tires. We can inspect the things that are most likely to cause trouble on a trip and let you know before you go. We want to keep you motoring happily down the road with no worries, unless it’s how to find the world’s largest ball of string on your trip. 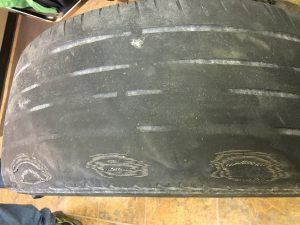 80% of tire problems occur in temperatures above 85 degrees F. Old tires are prime candidates for a blowout from a sidewall failure. 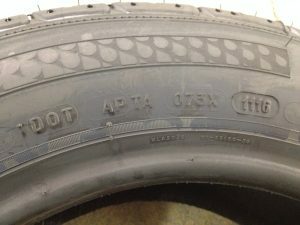 Check the age of your tires using the DOT number. In this photo, it’s APTA 073X 1116. The last 4 digits are the week of the year (11th week) and the last 2 are the year (16). These are fresh tires. Tires can sold as new that are years old. Don’t ignore this “freshness date”, as tires over 6 years old should not be trusted at Interstate speeds, even if the tread looks amazing. We sell fresh tires.